Marcus Oliver Johnstone Mumford was born on the 31st January 1987 in Orange County, California USA of British ancestry. Mumford is a singer and songwriter, the leader of Mumford & Sons group. In the band, he also plays the drums, guitar and mandolin in turn. 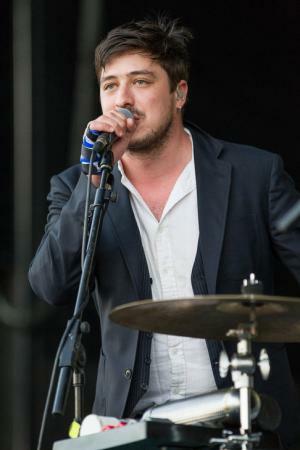 Marcus Mumford has been active in the entertainment industry since 2007. How rich is the singer? It has been estimated that the overall size of Marcus Mumford net worth is as much as $10 million, as of the data presented in mid-2016. To begin with, Marcus was born in the USA and so has dual nationality; as British citizens, his family returned to England shortly after his birth. He entered King’s College School located in Wimbledon, where he met Ben Lovett, his future friend and current member of Mumford & Sons. He continued his classical studies at the University of Edinburgh, and while still a student he wrote most of the songs from their debut album “Sigh No More”, which was released later in 2009. After he finished his studies, Mumford returned to London to concentrate on his music career. His professional career in music really began when he joined current members of Mumford and Sons, playing the drums for Laura Marling. These tours led to the creation of the group Mumford & Sons at the end of 2007. The band earned considerable popularity in the folk scene within a year, promoted by their performance at the Glastonbury Festival of 2008. In 2009, the band released their debut album “Sigh No More”, which was created with the support of producer Markus Dravs and managed to reach 7th on the UK charts. The first single “Little Lion Man” and the second single “Winter Winds” were also chart hits. In addition, the band was nominated for Grammy Awards in the categories of the Record of the Year and Song of the Year. Moreover, they were rewarded with the European Border Breakers Award (EBBA) in 2011. All members’ net worth rose considerably, including Marcus’ wealth. In 2012, six songs performed by the band appeared on the Billboard Hot 100. The same year the second album “Babel” was released, and was so popular that it reached the top of the music charts in the UK, USA and Canada; during the Grammy Awards 2013 “Babel” was named the album of the year. Furthermore, Mumford & Sons won the BRIT Award 2013 as the top British Group, and in the Echo Awards 2013 they won in the category Rock / Pop International group. All these acheivements and publicity helped Marcus to increase his net worth. In 2015, the third album of the band entitled “Wilder Mind” was released – again, it topped both the UK and USA music charts. To cut a long story short, the engagements in the life of Mumford & Sons band have increased the total size of Marcus Mumford. Additionally, Marcus works as a producer. He worked with Christian Letts and King Charles producing their albums, respectively “Hold Fast” (2014) and “Gamble For A Rose” (2016). Finally, in the personal life of the singer, he was in a long term relationship with Laura Marling, but subsequently married the actress Carey Mulligan in 2012, and in 2015 their daughter was born. Profession Songwriter, Musician, Lead singer in "Mumford & Sons"
1 Became engaged to Carey Mulligan in July 2011. 2 Was in a relationship with Laura Marling. 3 He went to the University of Edinburgh. 4 He attended Kings College School in Wimbledon. 5 He grew up in Wimbledon. 6 He's in the band, Mumford & Sons, and is the lead singer of the band. He also plays guitar, drums, mandolin and accordion. 7 Both his parents are from the UK, even though he was born in California. 8 Moved to England when he was six months old. The Book of Life 2014 writer: "I Will Wait"
Bella Vita 2013 Documentary writer: "Awake My Soul"
Inside Llewyn Davis 2013 arranger: "Fare Thee Well Dink's Song" / performer: "Fare Thee Well Dink's Song", "The Old Triangle"
The 55th Annual Grammy Awards 2013 TV Special writer: "I Will Wait"
How old is Carey Mulligan, who’s the actress’s husband Marcus Mumford and does she have children?